Bathrobes for men normally in fleece, sometimes in velvet have become again trendy products since the start of fall when soirées become more refreshing, all along winter. Sometimes, it is necessary to put on a bathrobe to avoid increasing room temperature one or two degrees and economize energy that will benefit your wallet and it will also be a good action for the planet. 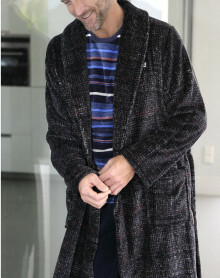 Opt for bathrobes from HOM, EMINENCE or even MASSANA and ATHENA. Bathrobes & fleeces There are 4 products. In addition to a pajamas or an indoor dress, what could be more enjoyable than slipping into a polar garment at the edge of the bed? In order to make you enjoy a maximum of comfort during quiet moments in your daily life, Mesdessous.fr proposes a whole range of models of robe and polar adapted to your moments of rest and cocooning throughout the winter . Find a selection of the best brands of men's dresses and polar outfits with EMINENCE, MASSANA, ATHENA.